Glass vessel vs ceramic undermount bathroom sink – comparison chart. Which bathroom vanity sink is better? Manufactured in variety of shapes and colors. Perfect option for any bathroom designs. Tempered frosted or clear glass sinks is a good combination with rich looking stone vanity tops. But vessel sink could be easily installed with any type of a vanity. Ceramic undermount is one of the most popular sink for any bathroom vanity top. Tempered glass is impervious to heat. Glass is non-porous material and does not stain or change color overtime. Ceramic sink with quality glaze finish has excellent stain resistant properties. Glass can be broken by heavy physical impact, but it is an extremely hard and one of the most durable sinks. Ceramic bathroom sink has excellent durability qualities and hard enough to withstand even heavy abuse. Glass as a material can last for centuries and quality glass bathroom sink is long lasting product with 30+ years of life expectancy. 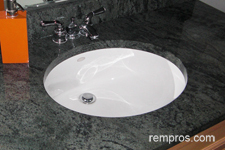 Undermount ceramic sink with natural or synthetic stone vanity top can last over 25 years. Adequately installed glass vessel sink is practically maintenance free product and require very little care. Low maintenance type of a bathroom sink. Greatly vary. Typically one year manufacturer warranty, but some producers offer lifetime limited warranty on their products. Depends on glass thickness and sink dimensions. Normally 16.5 inches (41.9 centimeters) in diameter, 5.5” (14 cm) deep round glass vessel bathroom sink weight about 12 – 18 lbs (5.4 – 8.2 kg). Vary. Rectangular, 15” x 19” x 7.5” undermount ceramic bathroom sink weight approximately 26 – 28 pounds. Greatly vary. 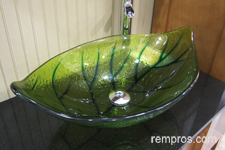 Some simple glass vessels sinks are very affordable, while others, custom shaped sinks could be quite expensive. Prices for undermount ceramic bathroom sinks significantly vary, but normally it is cheaper product compare to glass vessel sink. Charges to install glass vessel bathroom sink normally slightly lower in comparison with ceramic undermount sink installation. Vessel sink installation is relatively easy task. Installation of undermount ceramic bathroom sink is not a hard project. Approximately 30 minutes for experienced installer. Normally less than one hour. Broken glass normally impossible to repair and the sink should be replaced with a new one. Depends on damage, but typically hard to repair. 1 Rating was estimated on the scale from 1 to 5, accounting 1 as lowest and 5 as the highest quality of a product. Always consider the fact: not all products made equally the same and performance of particular bathroom sink significantly depends on individual product quality, adequate installation, and proper maintenance. Which bathroom sink is better? Glass vessel and ceramic undermount bathroom sinks are both great option for any bathroom design and style. They are durable and long lasting products. Which one to buy will mainly depend on homeowner’s preferences. Glass vessel sinks are available in wider range of options and it might be a better choice for creating unique bathroom design. Ceramic undermount sinks are very practical and due to affordability it is one of the most popular products.